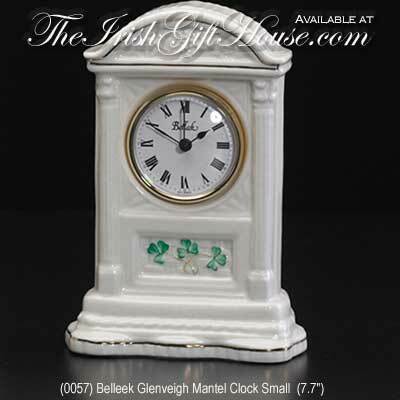 Belleek Glenveigh clock is made of fine china; it would look ideal placed on your mantel. This Belleek clock is battery operated. This Belleek clock is the Glenveigh design; it is named after the castle in County Donegal, Ireland. The Belleek Glenveigh clock is crafted of fine china that is enhanced with hand-painted shamrocks along with gold accenting and embossed elements. The Irish mantel clock stands 7 3/4" tall and it is handmade and hand-painted in Belleek, Ireland. The Belleek clock is gift boxed with a shamrock history card, complements of The Irish Gift House. Belleek Cashel clock is made of fine china; it would look ideal placed on your mantel or anyplace in your home or office. Belleek China Anniversary Clock features gold trim along with an embossed design. Belleek Regency Mantle Clock is made of fine china; it would look ideal in your home or office.